Edupreneur is an alien concept till recently. As a catch world it is spreading all over the world. With the onset of globalisation, entrepreneurship in education is growing leaps and bounds. India is home to edupreneurs for ages. In this volume, A.Prabaharan brings out 4000 years of Indian edupreneurship. From the gurukul education to community based education to colonial education to state sponsored education to the corporate education, he explores a variety of edupreneurs. It is a very exhaustive work on the educational entrepreneurship in India. 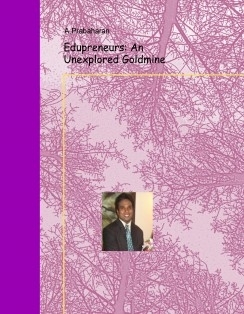 From giving a clear definition on edupreneurs to illustrating the theoretical framework to explaining the different contours of education entrepreneurship the author had done a passionate job on the subject. A.Prabaharan holds Ph.D in sociology from Jawaharlal Nehru University, New Delhi. He has over 15 years of rich experience in research, teaching and administration. He was awarded the President to India gold medal for academic excellence and leadership qualities. He has lectured in the most prominent universities in the world like Cambridge university, Australian National University, University of British Columbia, Copenhagen University, Karlstad University, Western Cape Town university etc.